Good Thursday. Want this by email? Sign up here. The banks said this morning that they would unite in an all-stock deal that values the combined lender at $66 billion. If completed, it would be the biggest bank merger since the 2008 financial crisis, and it comes after years of speculation that lenders needed to combine to cut costs and gain scale. A new banking giant: The combined lender would be the sixth-biggest in the U.S., measured by assets and deposits. The two banks currently hold $442 billion in assets and $324 billion in deposits. The terms: BB&T would pay 1.295 of its shares, worth $62.85 as of yesterday’s closing price, for each SunTrust share. (That’s a 7 percent premium to SunTrust’s closing price.) BB&T would own 57 percent of the combined firm. The new leadership team: Kelly King, BB&T’s chairman and C.E.O., would become executive chairman of the combined firm. William Rogers, his counterpart at SunTrust, would become C.E.O. The rationale: Analysts have said that regional lenders need to merge if they are to fend off bigger national rivals and insurgent online competitors. “It’s an extraordinarily attractive financial proposition that provides the scale needed to compete and win in the rapidly evolving world of financial services,” Mr. King said in a statement. German antitrust authorities will prohibit Facebook from combining user data from different sources without consent, the BBC reports. Facebook won’t be able to collate user data “outside of the Facebook website in the internet or on smartphone apps and assign these data to the user’s Facebook account” unless users give their voluntary consent. That will include Facebook-owned services like WhatsApp and Instagram. While the ruling applies only to the company’s operations in Germany, it could influence other regulators. That could make the social network’s plans to integrate all of its messaging services more difficult. Facebook plans to appeal. If it fails, it would be given four months to comply with the new restrictions. 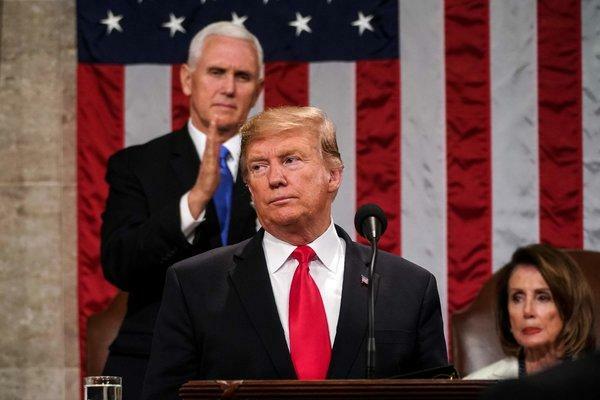 During his State of the Union address, President Trump called on Congress to help him make “investments in the cutting-edge industries of the future.” He devoted only a couple of lines to the issue in the 82-minute speech, but the WSJ reports that he appears to be serious. Should Trump be excited about a narrowing U.S. trade deficit? America’s global trade deficit fell in November for the first time in five months, according to Commerce Department figures released yesterday. On the surface, that looks like good news for President Trump. He thinks of the imbalance in trade with other nations as a sign that the U.S. is being taken advantage of. That the deficit fell to $49.3 billion in November from $55.7 billion in October suggests it’s becoming less of an issue. But it’s not all positive. “The data show that despite tariffs on Chinese goods, U.S. consumers and companies keep buying items from the country, importing 7 percent more merchandise in the first 11 months of 2018 than the same period in 2017,” Katia Dmitrieva and Shawn Donnan of Bloomberg write. Prime Minister Theresa May of Britain looks set for a tough day. She’s in Brussels for a series of talks meant to get her Brexit plans back on course — but will be greeted by some stony faces. Mrs. May wants to reopen the Brexit deal she struck with the E.U. She seeks “changes in the Irish backstop, designed to avoid customs checks on the border between Ireland and Northern Ireland,” Stephen Castle of the NYT writes, after Parliament rejected a previous version largely because of concerns over the border. So now what? “Officials in Brussels say they expect Thursday’s discussions to be polite, if not particularly productive,” Mr. Castle writes. President Trump officially nominated David Malpass, a top Treasury official and Wall Street veteran, to be the next president of the World Bank. Mr. Malpass is a contentious choice. “His appointment, which must be approved by the World Bank’s board, could prove controversial given Mr. Malpass’s skepticism of the bank and concerns that the Trump administration could politicize the role and use it to curb China’s growing global influence around the world,” write Alan Rappeport and Binyamin Appelbaum of the NYT. The delivery service said yesterday that it would change a controversial tip payout policy. Income inequality around the world is under fire. Howard Schultz’s potential presidential run, financed by his Starbucks billions, has been criticized by Democrats. Lawmakers are campaigning for higher taxes on the wealthy. • Mr. Manjoo concedes that some billionaires use their wealth for good. The moral philosopher Peter Singer has pointed to Bill Gates and Warren Buffett, who have pledged to give away the bulk of their money to charity. The metals company Arconic named its chairman, John Plant, as its new C.E.O., replacing Chip Blankenship. Bob Diamond stepped down as chairman of the investment firm Atlas Mara. Andrew Thorburn will resign as National Australia Bank’s C.E.O. following a government report critical of the country’s banking industry. Ken Henry will step down as N.A.B.’s chairman as well. Sonos’s C.F.O., Michael Giannetto, plans to retire from the speaker maker this year. The insurer Oscar Health has hired Sid Sankaran, who was most recently A.I.G.’s chief financial officer, as its C.F.O. Caryn Marooney, Facebook’s top P.R. executive, plans to retire after eight years at the company. CBS named Bill Owens, a veteran of “60 Minutes,” as its new executive producer.